NFL Week 1 is almost here and DraftKings & FanDuel are getting us hyped early in August! Player salaries have been released which means we can start to build our rosters! Remember, the New England Patriots and Kansas City Chiefs kickoff on Thursday, September 7th, so they are not eligible for the Sunday games. That means no Tom Brady, Rob Gronkowski, Brandin Cooks, Julian Edelman, or Travis Kelce. There is also a double header on Monday Night Football which means no Saints at Vikings or Chargers at Broncos players available. We decided to look at the top 10 QB/TE and 20 RB/WR salaries for Week 1 and compared how both sites priced them. There are more than 10/20 at those positions because each site has a different player or two inside their top 10/20. 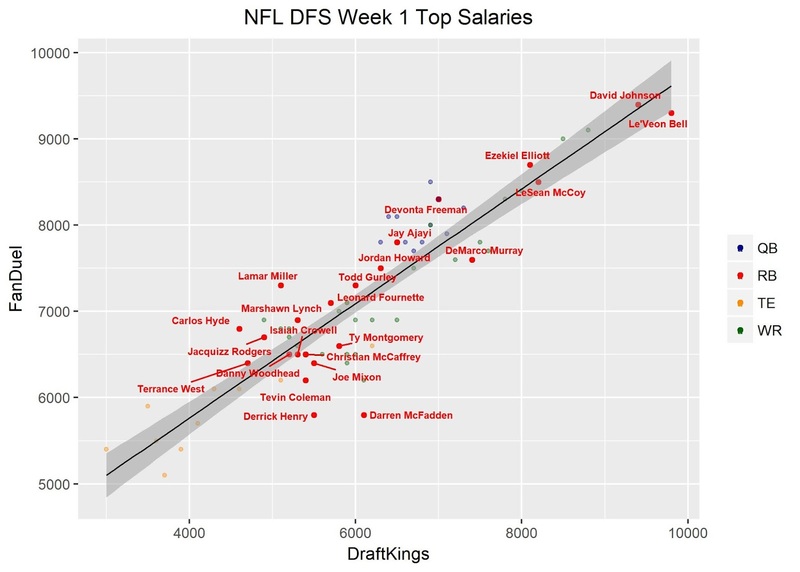 It's not exactly an apples-to-apples comparison since the DraftKings salary cap is $50k and FanDuel's is $60k. Also, DraftKings has a flex position instead of a kicker. It's hard to say whether a player is under or over-valued without knowing the week 1 points projections for each site. We will wait for our projections to provide us with more information before making any firm conclusions. Click here to see our MLB DFS Projections app and bookmark it for the NFL season! 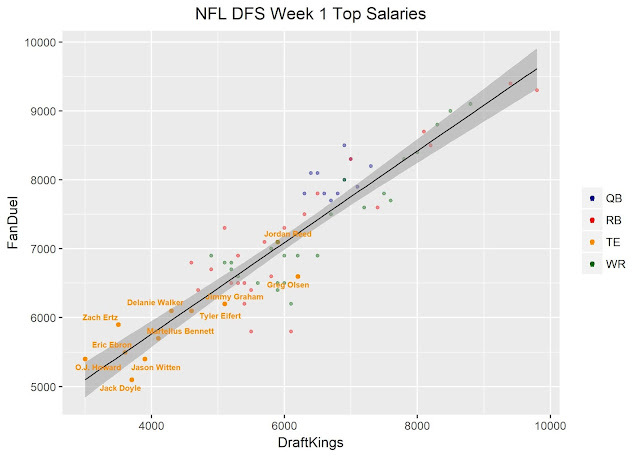 Last year on DraftKings, the top 10 priced QBs averaged 24.8 points in week 1. At 8300, Luck was the 2nd most expensive QB behind Rodgers, and his 38.5 points at home against the Detroit Lions was the weeks top score. Brees and Alex Smith were the only others to score 30 points. Smith was the 19th most expensive QB. Wilson (7900) and Cousins (7400) were the only QBs, in the top 10 pricing, that scored less than 15 points. Eli Manning (7500, 19.28) was the only other to score less than 10. The 3 most expensive quarterbacks averaged 32.49 points. 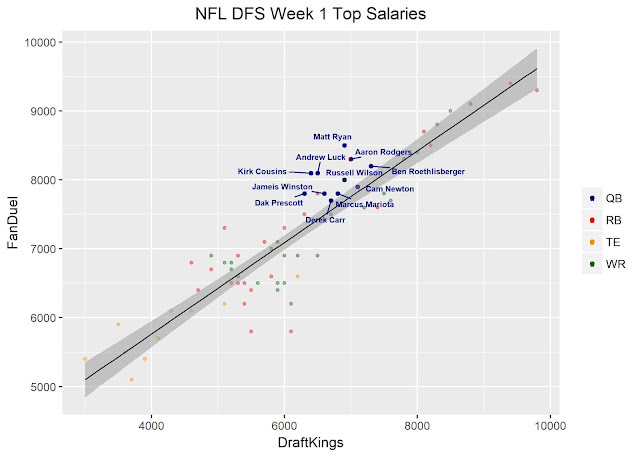 On FanDuel, the 10 most expensive QBs averaged 21.45 points. The three top priced QBs averaged 30.16. Four of the top 10 scoring quarterbacks were cheaper than 7700. The Falcons gets the Bears week 1 who one of the worst defenses in the league. 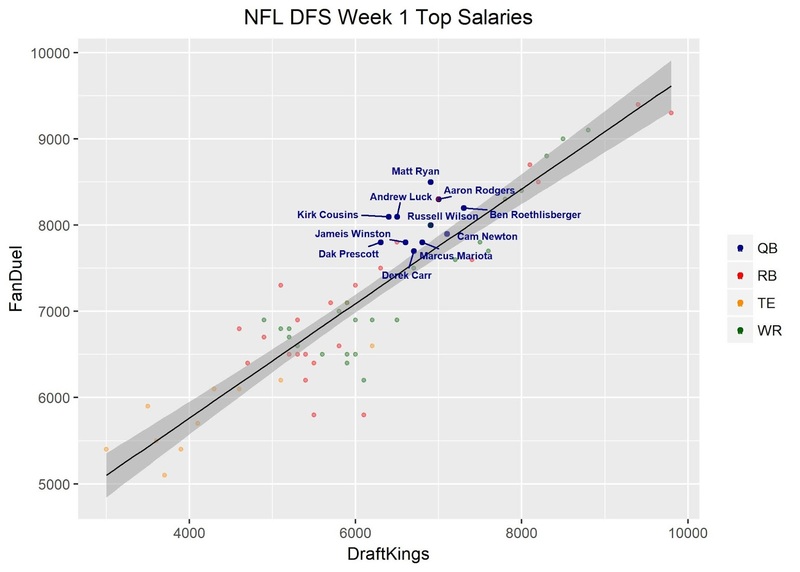 If you want to spend big on a QB, Ryan is pretty safe, but a bit more expensive on FanDuel compared to DraftKings. Roethlisberger gets the Browns week 1, but let's not forget just how much worse he plays on the road. At his price, I think I will pass. I will consider Cousins on DraftKings, but I might have to pass on FanDuel. The Eagles defense is much better than people may realize but Cousins has had success against them. 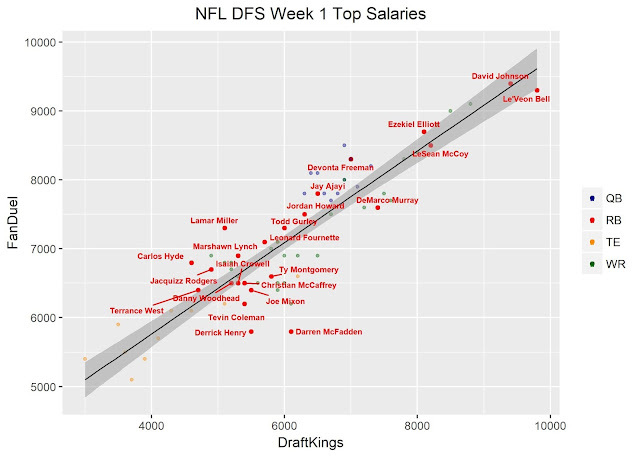 Last year on DraftKings, the top 20 priced RBs averaged 15.2 points in week 1. DeAngelo Williams led the position with 38.1 points, on the road, against the Redskins. At just $4400, Spencer Ware (35.9) was the only other RB to hit 30 points. Five of the 20 most expensive RBs scored less than 10 points, including Gurley (7800, 5.2) & Adrian Peterson (7600, 3.1). The 6 most expensive backs averaged 16.75 points. On FanDuel, Williams was the highest scorer of the non QBs with 32.1 points. The top 20 priced RBs averaged 12.94 points in week 1. 45% of them failed to score double-digits. The 8 most expensive RBs averaged 9.67 points. Four of the top 11 RB that week were priced under $6k. DraftKings is really banking on Elliot facing a suspension, pricing McFadden at 6100. Fournette, McCaffrey, Mixon and Henry are all RBs you can ignore in week 1 at their price. Three rookies and a backup RB that saw 15 carries twice and failed to rush for more than 65 yards last year. Miller, Hyde and Rodgers are cheap on DraftKings - remember Doug Martin is suspended for the first four games. 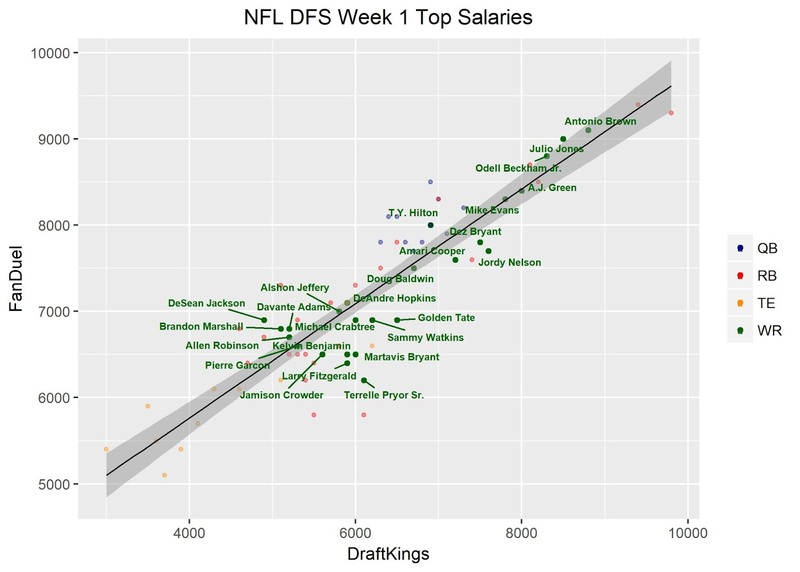 Last year on DraftKings, the top 20 priced WRs averaged 17.5 points in week 1. Green's 39 points was the weekly high across all positions, on the road against the Jets. Cooks (7700, 36.4), Brown (9800, 35.6) & Willie Snead (4800, 35.2) were the only other WRs to hit 30 points. Bryant's 1.8 was the worst performance of the expensive receivers. Marshall (7800, 6.2), Watkins (6900, 6.2) & Thomas (7000, 8.8) were the only others to score less than 10 points. The 6 most expensive receivers averaged 20.12 points. On FanDuel, Cooks outscored Green by 0.4 points to claim the top score by a WR but was the fourth best overall total. The top 20 priced receivers averaged 14.54 points. 7 of the 20 failed to score 10 points. The 8 most expensive WRs averaged 15.01 points. Five of the top 15 scorers were priced under $6k. If you are going to play Jackson, please make sure it's on DraftKings only! Same can be said for Marshall and Adams. Pryor is that same guy for all you playing on FanDuel. Hilton's price on DK reflects the possibility of no Andrew Luck. If it turns out that Luck plays, Hilton could be a steal. Last year on DraftKings, the top 10 priced TEs averaged 9.79 points in week 1. Gary Barnidge (4700) put up a goose egg on two targets. Coby Fleener (4900, 1.6), Jimmy Graham (3800, 2.1), Antonio Gates (4200, 5) and Delanie Walker (4500, 7.7) all scored below 10 points. Not in the top 10, at $2500, Doyle was the top scoring TE with 18.5 points at home against the Lions. 50% of the 12 TEs that scored double digits were priced outside the top 10. The 3 most expensive TEs averaged just 13.7 points. On FanDuel, the 10 most expensive TEs averaged 8.36 points. The top 3 priced TEs averaged 8.8 points. FanDuel is way overvaluing Bucs rookie TE Howard while DraftKings seems to have forgotten about Ertz. Witten averaged 10 targets in the two games against the Giants vs 5.6 looks from Prescott against the rest of the league. If Elliot is suspended I am going to fit Witten into my lineups. Doyle too if Luck plays.